We are please to welcome group visits, particularly if we are notified in advance! Ideally you should plan your visit during normal opening times. The normal adult admission rate is £5 but groups of 10 or more are discounted to £4.50. There are also discount rates for children and families. Special rates apply on events days (generally Bank Holidays). At slightly higher cost per head, a guided tour with optional refreshments will enhance your visit to the museum; as these are pre-booked we are happy to conduct these outside normal opening hours too. 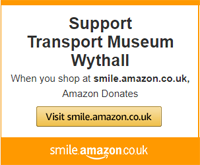 Minimum charges apply on guided tours, please advise your requirements and obtain a quotation through enquiries@wythall.org.uk or by post to Group Visits, The Transport Museum, Chapel Lane, Wythall, Worcestershire B47 6JA. Coach drivers with groups will get free admission and looked after with a cup of tea and biscuits.